Minamino Shuichi, more commonly known as Kurama, is the human side of the Thief King, Youko. He is analytical, cunning, and very protective over the people he cares about. He is merciless to anyone who poses as a threat and was thought to become the strongest member of the Urameshi group until Yusuke Mazuko lineage awoke. Kurama is also self-sacrificing and therefor recieves the most serious wounds in battle. This is one of the older pictures I have in my hard drive. I was surprise to have found it after so long. So which Kurama cosplayers do you prefer among the four: the first, second, third, or this post? How many Kurama’s have plagued this blog? I think I may have lost count… Being that he has 2 forms (ok, 3 including his full fox form), and he’s one of the most popular characters in the Yu Yu Hakusho series, I’m not surprised so many cosplayers portrayed him. I suppose people will complain about the usage of fake roses as opposed to real ones… But, I don’t think real roses can be arranged to intertwine that way, can it? You have to admit though, the pose and the expression on Youko’s face is absolutely gorgeous. Probably one of my most favorite cosplays of him so far! Nice job! Oh my… I didn’t think there’ll be more Yu Yu Hakusho cosplays that are being done recently… But according to this picture, it was uploaded December 10, 2007 on High King’s Flickr account. The demon Youko is good, though I think wearing the wings made of petals and vines he used to fly around the Demon World may be a bit much… What I’m really impressed with is Hiei! 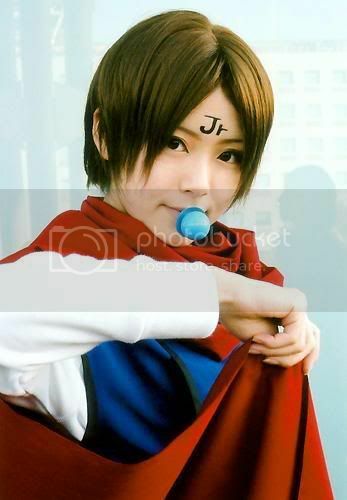 The cosplayer’s got the look and attitude just right! Hope you like it, Shadow Cat! Yes, the fangirl screams for Kurama never dies. Thanks to Swanky from Flickr for the photo! Check out other cosplay photos by Swanky in his Flickr account! 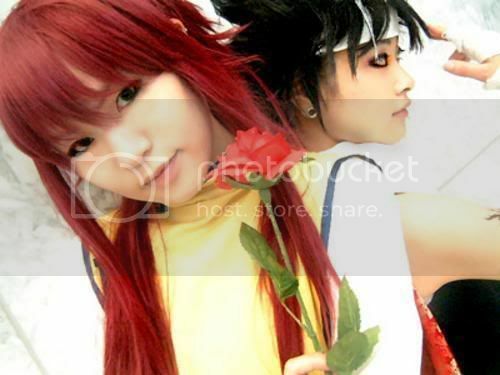 I never thought I’d see the day when I’d find a cool looking Kurama and Hiei cosplay. Photobucket really has its wonders. Though I believe both cosplayers are females. Here’s a trivia for you… Did you know that Kurama is named "Denis" and Hiei is names "Vincent" in the Filipino dubs? Worse, they first gave Kurama a female voice, saying that he is a girl when he is in the human world, and a guy when he is in the demon world. You are currently browsing the archives for the Yu Yu Hakusho category.